If answer is "yes" to Mark-up or Message added, please upload a scan or picture of your content with mark-up applied. 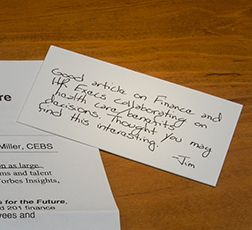 Sample - Handwritten message placed on the back of your business card! Enter message for your Business Card Campaign here (100 character limit). Remember to include your "sign off" and your name. Please allow up to 2 weeks for delivery of your campaign to the shipping address you provided. Use this drop down menu to select the category of Greeting Card of your choice. "Next" will take you to individual options per category. 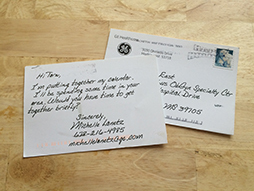 There are no preprinted message options for any of the invitation cards. 4.25 x 5.5 Card with or without your logo. 5 x 7 Card with or without your logo. 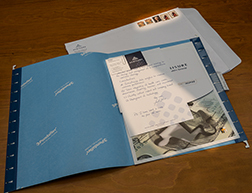 Select "Next" to advance to the Direct Mail medium to include in your Hanging File Folder Campaign. 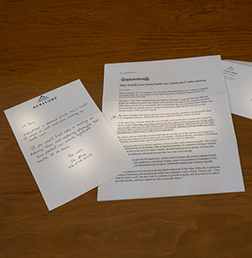 Send content of your choice with a 5 x 7 sheet of your branded Note Sheet with handwritten message! Send a 5 x 7 custom, branded Note Pad with 25 sheets per pad with your handwritten message on the first sheet! 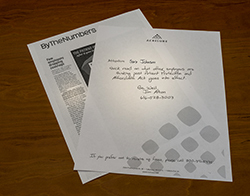 Rainmaker will create your Note Pad using the high resolution logo you provide. 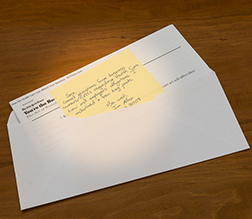 Send content of your choice with a Sticky Note with your handwritten message!